The Cardinal has wheels, the Met Office has a forked tongue, and why England is now awful at The Science #narrowboat #England – The Diesel-Electric Elephant Company. Her Flop-Bottied Majesty’s The Meteorological Office speaks lies. I ought to have read this in yester-yestereve’s cloud formations at dusk. If you look closely you can just see “don’t you believe it” spelt out in cumulo-thingummy. They said, yesterday, that Her Majesty’s wind would be on the cuddly side of mild, when in fact it was heading towards “quite blustery”. They fooled me enough to untie the Cardinal’s strings and to mooch us onwards, but we moored (the Cardinal and I, etcetera, etcetera, etcetera) mostly [only] because the blusters were blowing onto the towpath at our designated target. This gaveth me time to leap off with centre-line, pin and mallet. Leaping off was a case of One Small Step For Man, One Giant Leap For The Gusset Of My Jeans, since the canal hereabouts is sore afflicted with “The Shroppie Shelf”, that incredibly silly underwater projection that makes mooching up to the side impossible in any boat with a draught of more than three inches. The view this morning from the side-hatch is a bit of a hedgrow, but the view from the galley window is most definitely not Hackney. While it is not Hackney, we may well be in Barkney, and this brings me to why England doesn’t any longer do the science or the industry. Well, I didn’t want to complain, preferring instead to put a positive spin on things, so I wandered along and suggested that we grasp their little rat’s incredibly annoying properties as an opportunity. We know, I said, what it sounds like in damp, canal-side air at ground level, but what, I wonder, would it sound like from under two feet of the sandy loam that we are blessed with in these parts, and how long might it yap yap yap then? What might it sound like, for example, from under a fathom of canal water? Could we achieve and measure the Doppler Effect by experimentally drop-kicking it into oblivion? Would the cadence of the yap yap yap increase or decrease if we Duct Taped it to the tracks of the nearby West Coast Railway Line? It’ll be fun, I said, we can collect data, draw graphs and diagrams and perhaps push the envelope of human scientific knowledge a little farther into the hitherto unknown. Well, the sad response was that they just weren’t interested. That’s the problem, you see, with England these days – unless it is an exercise in “victim” or “grievance” studies, no-one is interested in experimenting, in getting their hands dirty with real field-work. Is it any wonder that we have no real industry left, no centres of genuine learning? I approached them again this morning with an idea I’d had overnight for a solar-powered rat-on-a-string flinging trebuchet, but received the same indolent, dull, cold, dead-eyed look. I offered to supply the experimental shovel myself, and to bring my own graph paper and crayons for data-recording purposes, but to no avail. These canals were built by Victorian chaps who had enquiring minds and a sense of the importance, the vital, all-encompassing importance, of science. They are now largely populated with unadventurous dullards who have no interest in finding out how their little doggie works in a variety of conditions. These new moorings leave the Cardinal and I facing, eyeball to eyeball, the first of the fifteen locks in a row of Audlem. We shall be tackling them soon, as soon as I have kicked seven shades of wind out of the Met Office, as soon as I have walked their length and taken their measure. As soon as I have watched my Jean-Claude Camille François Van Varenberg Van Damme aerobic work-out DVD a few more times. There it is, just through that bridge. The mood and the madness will come upon me in the next few days, as it always does. I are in no hurryth. In a strange sort of way I am looking forward to tackling them, but not at a weekend, not with so many helpful boaters engaged in their own transit. A walk and a grok of them first, methunkth. We’re moored on pins here, and last night gifted the canals and towpath some ten hours of constant rain, so the longer I stay and the more helpful folk who speed past (thinking, as they do, “car slow”, not “canal boat slow”) the more time I’ll spend banging my pins back in, and – heaven forfend – turning into a Grumpy Old Hector. Would you, dear reader (singular), still recognise me if I were to turn into a grumpy soul? Perhaps a fresh approach will curry enthusiasm? Hmmm – curry. Where’s my poodle-boiler? Did Glenn Close ever actually return it to me? Can I still use it for poodle, or will the taste of boiled bunny linger in the pot? How does one properly stuff a miniature poodle, and with what? He’ll never know a thing about it – I put castors in place of the wheels. With the aerodynamic ground-effect the Robin might even be faster! I’m reet chuffed with the way these have worked, I wasn’t convinced that they’d be big enough. 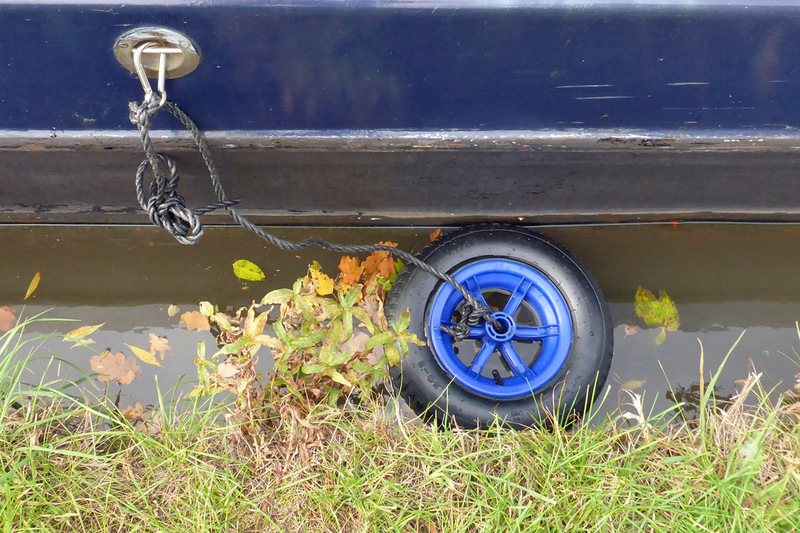 Some folk use old car wheels and tyres, but I am trying to not drag the neighbourhood down too much… Probably in days gone by I would have employed ne’er-do-well ragamuffins to squash themselves betwixt boat and ledge – a penny a squish, perhaps, and glad of the work. My sister lived next door to a similar rat, only his caretakers had his voice box removed, so he would stand in the yard making full effort at yapping and all that happened was a small odd air noise. It was pathetic but as my sister pointed out – it made the world a much more peaceful place. I think I would suggest that next time you mosey past the yapper. Shouldn’t you get crew for the locks? I keep worrying about you doing all of it alone. It seems like a dangerous chore to do alone. Have to wonder about the dogs like Yappy – do they annoy their owners/keepers as much as they annoy everyone else? Give me a full-sized hound that doesn’t feel the need to bolster its own ego by shouting, any day! You have been invaded by Jack Dwarf as a friend of mine calls the neighbours yappy chappy and this one of a more exotic breed of ‘unknown’ origin. As one professional researcher to another your methodology is most impressive! Not forgetting you always test against a ‘control group’ and here I suggest a boil in the bag basmarti rice which should do it and be useful later (assuming the bag doesn’t burst during the trials). Oddly enough, I haven’t heard a peep out of the yappy little thing since early this morning – I wonder if the owners have gagged it? Can’t help but picture the poodle with a studded leather gag holding a red ball in its mouth… we can but hope!